Most farmers can’t help but collect things. I’ve heard farming described as “constant creative problem solving” though some would simplify that down to tinkering. In that line of work, however you call it, you never know what you might need, and so most things that could be trash, are saved just in case. Not a day goes by here that I am not surprised, amazed, skeptical or intrigued by some new gizmo, tool or machine. Today’s dose took my expectations to a new level. Our task was “cleaning seed” as it’s called, though the verb is a bit misleading in my mind. The goal is to take your seed, which in our case was about ten, fifty pound bags of mixed grain that was harvested from a field last fall and separate all the different types of grain. The field had oats, barley and wheat planted on it and so the bags of seed are a random mix of those grains and luckily each seed has a slightly different size and weight. Enter genius engineer. 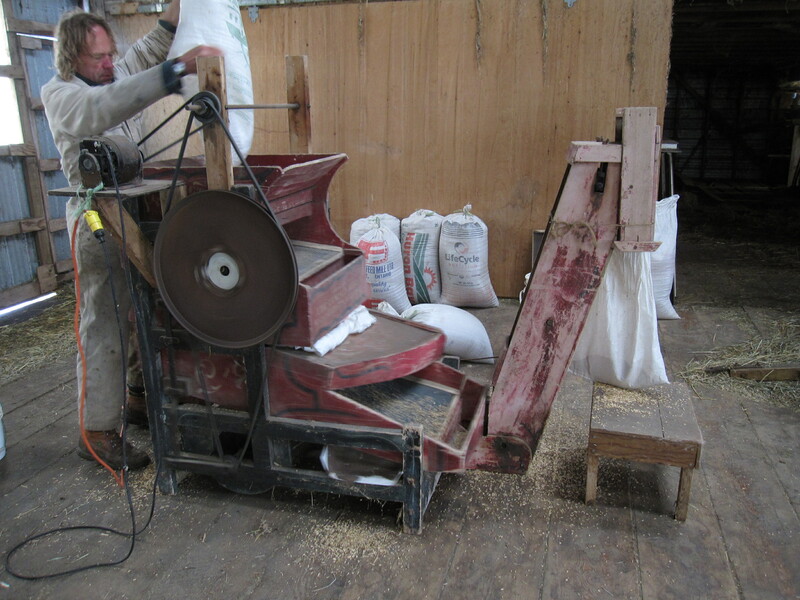 The thought of dealing with the hundreds of thousands, if not millions of seeds in those bags was staggering until Tony unveiled his turn of the century Perfection Seed Cleaner, (model patened in 1901). It looked like a candy maker out of the Wanka Chocolate Factory with its red, fading paint , and creaky wooden frame. 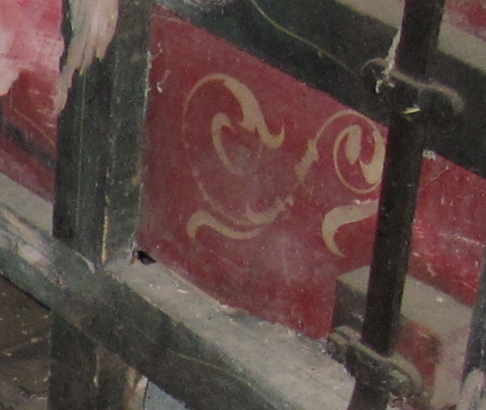 Long gone are the days when farm machinery was painted by hand. Apparently an old farmer, turned collector saw an article about the farm and was so inspired by what Tony and Fran were up to that he called them up and said that he wanted to donate some farm equipment to them to help their cause. 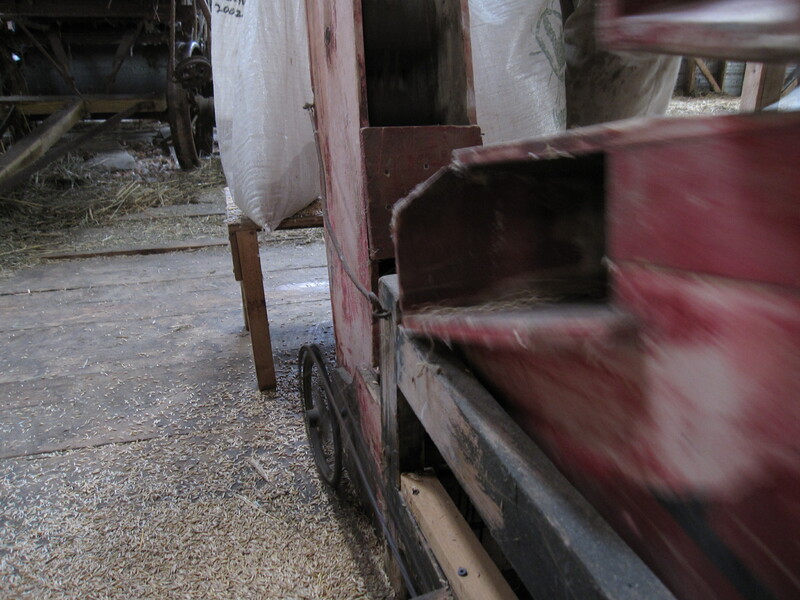 This, probably one hundred year old, hand-cranked seed cleaner was one of his donations. Tony has since rigged up a small electric motor for the sake of the many apprentice shoulders that have suffered cleaning seeds, and its electric input was minuscule compared to the energy produced by our wind generator today. The basic principle behind the machine is to sort the seeds by their weight and size using bouncing sieves. But the most important function of the machine is to weed out the light seeds that are unlikely to germinate well. This is accomplished by much bounching and with some well placed fans that blow the light seeds out onto the floor. (As pictured to the left, the seeds are blurred, as is the machine since it was shaking like a poorly leveled washing machine!) While the light seeds are being blown to the floor, the small wheat seeds fall all the way through and end up in a drawer on the bottom layer. 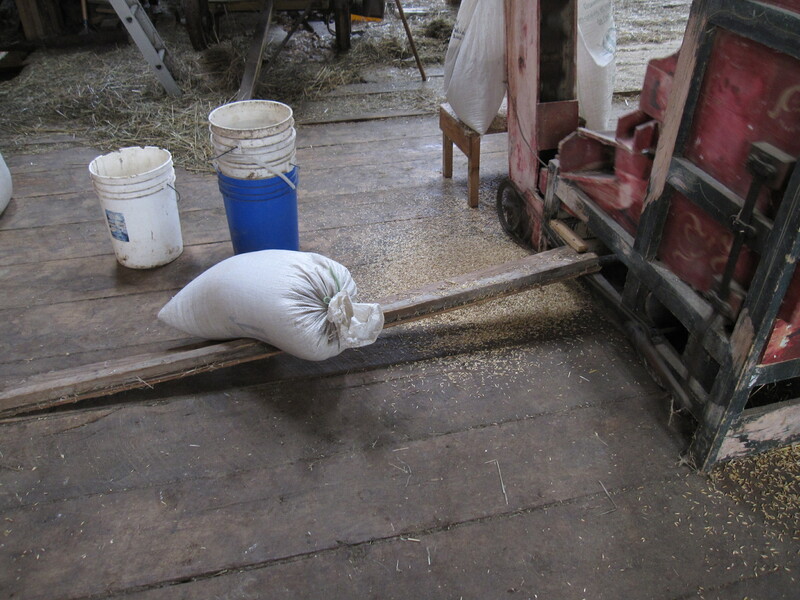 Oats and barley on the other hand, are very similar in weight and seed size so we don’t make an effort to separte those and they pass on to a conveyer-belt type bucket elevator where they are dumped into the awaiting bags, ready to be planted. Below is a video of this fantastic machine in action. Throughout the course of the day we cleaned about five-hundred pounds of seed, which ends up being a little more than a bag an hour. If we were a major grain operation that would be laughable, but we only need that much to plant our fields of grain, and we may clean more to grind into feed. Yet it was the mentality of the whole ordeal that struck me. Coming from a world where you throw out the broom when the broom handle brakes, this relic, this collectors item to most was a working, functioning piece of the farm. It had its quirks and idiosincrasies like the “custom chain tensioner” that Tony rigged up (pictured right), which is nothing more than a ten foot two-by-four resting on the chain with a feed bag on top to weigh it down. My concept of waste has been called in for questioning. I’m not talking about that urge to save old irigation tubing that is brittle and cracked for the off chance that I might be able to use it, no, I mean the impulse to get the newest, fancy gizmo rather than using what you have. It makes me look at my own life like we look at the farm, what do you put in, where does it come from, and what do you get out of it? Damn right!! I’ve always hated that “impulse to get the newest gizmo”. This weekend I’ve been working in the field, in La Rioja, with the same old hammer (yours), compass and magnifying glass, wearing the same old shirt, sweater and jacket (all of them from my cousins) that I’ve always worn in the field trips. Why change them if they are useful?? Just because they look old and a little bit overused?? But I didn’t wear my field jeans, I had my new overalls you brought me. I love them.